VPL Terms and Conditions: New CRF125F, Subject to model and colour availability. Representative Example based on 2 years 0% VPL. Offers applicable at participating dealers and are at the promoter's absolute discretion. Indemnities may be required in certain circumstances. Finance is only available to persons aged 18 or over, subject to status. All figures are correct at time of publication but may be subject to change. Credit provided by Honda Finance Europe Plc. Cain Road, Bracknell RG12 1HL. Honda Finance Europe Plc is authorised and regulated by the Financial Conduct Authority, Financial Services Register number 312541. Riding off-road on trails, motocross tracks and back yards is an activity that often involves the whole family. For children it’s a perfect introduction to motorcycling that quickly builds skills and machine control, so useful in adult life whether in competition or out on the open road. For Honda, attracting young riders early in their career is a great introduction to the brand and its engineering values. Honda’s CRF range spans recreational and competition off-road machines and is steadily becoming a brand within a brand. The CRF50F and 110F get youngsters riding early, having fun and learning, while the CRF250L and 250M add road-going dual-purpose and Supermoto attitude respectively. For Enduro use, the CRF250X and 450X are the ideal tools for the job. And the awesome CRF250R and CRF450R – with state-of-the-art engines, frames and suspension – stand at the pinnacle of Honda motocross racing technology and inspire every other CRF in turn. Honda’s return to the Dakar rally with a works team for the first time since 1989, with the CRF450 Rally, further underlines the importance of off-road racing to the company. The CRF125F is the latest new bike to join the CRF family. And while it maybe small the CRF125F is very much a fully-grown motorcycle, delivering big off-road thrills, excitement and experience. 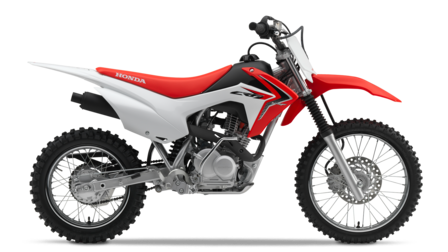 Replacing the CRF100F, the CRF125F not only features a larger capacity; its air-cooled four-speed engine has been tuned specifically to give plenty of novice-friendly bottom-end torque. The addition of electric start also makes life easier for the young rider. A brand new frame, uprated suspension and brakes manage the improved performance and deliver confident handling and stopping. And the CRF450R’s cutting edge design provides styling cues for the CRF125F’s bodywork. In essence the CRF125F is built to be everything the young entry-level rider could possibly hope for as they continue their off-road journey. It’s tough, reassuring, easy to look after and a whole lot of fun. Which is actually what the final “F” in every CRF-F model stands for – Fun. A brand new steel diamond backbone frame gives the CRF125F chassis the perfect balance of rigidity and strength ensuring a stable and engaging ride. The integrated air box/battery design – fitted lengthwise in the frame – keeps the bike slim and a seat height of 785mm makes it very manageable for most youngsters aged 10 and above. Wheelbase is 1,254mm with rake and trail of 27°/94mm. Wet weight is 88kg. Beefed-up 31mm telescopic forks – the CRF100F used 27mm – feature heavier weight springs and 150mm stroke. The new rear shock uses a 32mm diameter piston damper and separate air/oil/gas pressurization chambers to reduce emulsification. It has a 150mm stroke. The high suspension quality means bump absorption, ride quality and tracking are much improved. A steel swingarm works through Honda’s Pro-Link system, and needle bearings have been used throughout to reduce friction. For stability and traction front wheel size is 19 inch, matched by a 16 inch rear. A 220mm front hydraulic disc brake – with adjustable span lever – deals out consistent and easy to modulate stopping power. It’s complemented by the 95mm drum rear. New contact points – wide-set footpegs and brake pedal – match narrower handlebars and give great control. The grips employ the same ‘half-waffle’ rubber as used on the CFR450R: the waffle ridges give improved fingertip sensitivity and subtler throttle feel. A redesigned kickstart lever hinges at the bottom for better leverage. The CRF450R’s ‘triangle proportion’ bodywork transfers readily to the CRF125F and the same benefits – complete freedom and ability of the rider to move around – are evident. Fuel capacity is 4.3-litres and ignition is secured by key. The Extreme Red and Ross White graphic treatment provides the finishing CRF signature. Robust and low maintenance the 124cm3 air-cooled SOHC engine powering the CRF125F delivers strong and linear bottom-end torque – a significant step forward compared to the CRF100F. The focus of Honda’s engineers was around speeding up gas flow velocity, and reduced valve overlap and lift generate performance gains at low-rpm and low-speed. Bore and stroke is set at 52.4 x 57.9mm. Peak power of 6.6 kW arrives at 7,000rpm, peak torque of 10.2Nm @ 4,500rpm. Fed by carburettor, a new airbox design – located lengthwise – saves weight, increases airflow and also locates the compact battery needed for the electric starter. The air filter uses the same type of element as the CRF450R for a greater surface area and increased air intake volume. Powerful, zero-fuss CDI ignition also boosts performance, as does the new exhaust. The drive sprocket cover is no longer integrated with the ACG cover for improved accessibility when replacing the front sprocket. The four-speed manual gearbox and clutch – a key part of the first real dirtbike philosophy – are smooth changing and easy to use. provisional and subject to change without notice.